Hey guess what? It’s 420 today! 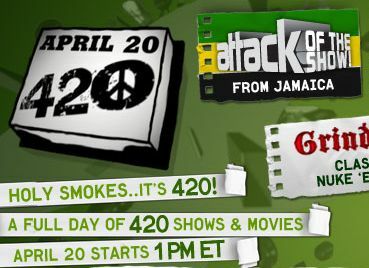 G4 has an awesome lineup for today celebrating the famous stoner holiday. For those of you that are not choosing to partake in celebrations, or you have the munchies and need something to watch, turn the channel to G4 and keep it there! Attack of the Show from Jamaica – Judging from Kevin’s blog, and the pictures he posted on Flickr, they had a great time in Jamaica. I can’t wait to see Bernard’s Shroom Soup! And who wouldn’t want to see Olivia cliff-dive in a bikini? Nobody, that’s who! Half Baked – If you have never seen this masterpiece, you are missing out. See Dave Chappelle at his greatest. Grindcore – Check out Class of Nuke ‘Em High with Chris Gore. He’s going to take you through the film with trivia and key scenes from the film. Code Monkeys – Tommy Chong, the infamous stoner legend makes a guest appearance in this brand new episode. Also, Code Monkeys has just been picked up for a new season! Reefee’s Madness – Remixed and Remastered, and twice the awesomeness of the original version. The Block (Season 2) – If you missed season 1, The Block is kinda like real world… but a lot more partying, girls, and snowboards! If you don’t take part in the 420 madness, G4 has you covered too. Check out their top 4 and 20 things you can do instead. All the fun starts at 1pm ET today only on G4! And for the record, no this post was not sponsored by G4. It’s just that awesome of a network!